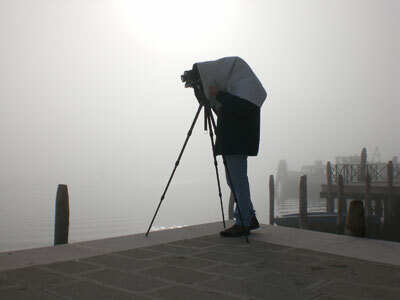 Marco Bianchi with his camera in Venice. Marco Bianchi was born in Milan in 1962. After graduating in Law he devoted himself entirely to the wilderness and the mountains. His passion for mountaineering began as a child with his first hikings in the Dolomites and, after years of intense activity which drove him to climb the majority of the classical routes of the Alps, in 1991 he made his first Extra-European expedition and climbed the Aconcagua, the highest peak of the Americas (6,959 mt). From 1992 to 1996, in only five years, in Himalaya and Karakorum he climbed seven of the fourteen Eight Thousand Peaks: Manaslu, Broad Peak, Cho Oyu, Shisha Pangma, Dhaulagiri, Everest and K2, without oxygen or high altitude porters. He opened three first Italian routes, a new route of 1,200 mt and made a first repetition in alpine style. In 1995, after ascending the Everest, he was awarded the Targa and silver medal of the National Award Torretta. In 1997 he was appointed member of Club Alpino Accademico Italiano and in 1999 he received the Benemerenza Civica of the City of Milan. From 1993 onwards he has given lectures with slideshows all over Italy on the world of Eight Thousands and the Himalaya. As a professional photographer, since 1996 he has realized many articles and reportages on mountain, nature, the animal world and travels. In 1998 he published his first book with the publisher Vivalda: Montagne con la Vetta, where he narrates his adventures among the Eight Thousands. Then, with the publisher Mondadori, he published four photographic books: Omaggio alle Alpi (2001), Gli Ottomila (2002), Sulle Vette delle Alpi (2004) and Tra Cielo e Terra (2005). Since 2001 his involvement with photography has led him to approach the traditional photography in black and white and, after attending courses at the John Kaverdash School in Milan, in 2005 and 2008 he attended the workshops held in California by John Sexton, one of the world´s most important contemporary photographers, former student and assistant to Ansel Adams. Today Marco Bianchi works exclusively in the field of traditional black and white photography. His pictures are made with a Linhof Technika 4×5″ view camera. All the steps of the process generating his prints, from the development and the print of the negatives to the mounting of the Fine Art print on the frame, are done in his laboratory near Lake Orta by him personally.